Click HOLY WEEK SCHEDULE above for our Special Liturgies during Holy Week and Easter. Get ready to roar, because Summer Faith Camp registration is open! We are calling for all Campers ages 4-rising 5th graders, teen volunteers who are rising 6th graders and older, and adult volunteers to join us for a week of safari fun and adventures. Click here for volunteer and registration forms. 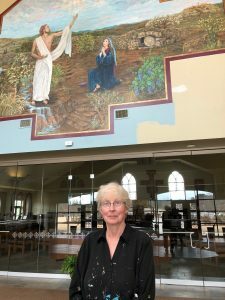 In 2017 Father Terry said he wanted a mural to be painted on the wall above the glass doors in the narthex. He described a scene with an open tomb, the stone rolled away, and the resurrected Jesus telling Mary Magdalene, “Do not touch me, as I have not gone to the Father.” I said I could paint the scene, but asked how I was going to get up to the wall? Father Terry said to let him worry about that. Work started with the shape of the mural and figures, which were designed to fit the style of the church. Several small-scale drawings were made. As the first drawings of the mural progressed, Father Terry suggested some details: a few of the apostles, the city of Jerusalem, and Golgotha with the three crosses. The internet has a wealth of information, including pictures that show how other artists have interpreted this scene, but the church needed its own interpretation. Beginning in May of 2017, the shape of the mural reflected the arched shape of the windows. It was later changed into a dome shape, and by October, the mural took the shape of the San Damiano cross found above the altar. The size and shape of the mural and the size of the figures of Jesus and Mary Magdalene were calculated using church blueprints of the wall. The design was ready, but the wall was not. The plaster cracks needed repairing, and the wall needed priming, as it had not been repainted since the church was built. After research and sketching preliminary drawings, a small-scale chalk sketch of the mural with the poses of the two figures was drawn in February of 2017. With a few adjustments for perspective and to avoid the chandelier blocking the view from the ground, in May of 2018, Johnny Holloway taped off the mural shape of the San Damiano cross. He repaired the cracks in the plaster and primed the wall in the shape of the cross using four background colors. Father Terry rented a lift and harness. Painting was underway. Research continued even though drawing and painting had begun. Additional information about the time of Jesus helped with the design and painting of the appropriate plants and flowers, birds, clothing, old Jerusalem, Golgotha, the Mount of Olives, gardens with tombs, the topography and soil of Israel, the size and shape of the shroud of Turin, and the sky at dawn. 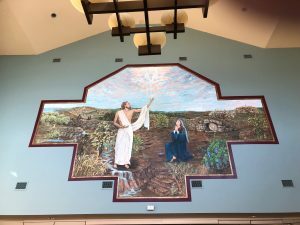 The final small-scale figures of Mary Magdalene and Jesus where drawn, and in June of 2018, they were projected onto five feet by five feet sheets of cloth donated by Linda Porter. Using the big glass doors of the narthex with the sun shining through, the cloth was turned over and the figures were traced with chalk, on the back of the large squares. After Vince Antonich gave several lessons on how to go up and down in the lift, Vince drove it into place and the painting could finally begin. The cloth was flipped to the front side, taped to the wall, and the figures were traced again. The chalk on the back side of the cloth transferred the drawings to the wall. Adjustments were needed for perspective, figures were redrawn, and painting on the wall started in July of 2018. The figure of Mary Magdalene was painted first with the random face. Then the morning sky and the dove representing the Holy Spirit were painted. The shape of the Holy Spirit needed to be something unique to Mary Magdalene Church. The dove shape was found in an unusual place. The shape of a dove had formed in the moisture inside the ached double paned glass above the doors at the entrance to the church. The shape was not only unique but was also a part of Mary Magdalene. The outer shape of the mural evolved out of necessity. The San Damiano cross shape came too close to the head of Jesus. Father Terry solved the problem. He suggested a Greek cross shape and drew the adjustment to the San Damiano cross. That became the final shape of the mural. Once the sky, Holy Spirit, and Mary Magdalene had been painted, it was time to add many of the background details, including the wall around Joseph of Arimathea’s garden and appropriate vegetation. Also, the face of Mary Magdalene was changed back to the original model. Bit by bit the mural progressed. In September of 2018, Golgotha, the tomb, and the old city of Jerusalem were painted. As research continued and new information came in, Jerusalem was repainted several times. Also painting of the face and figure of Jesus began. Parishioners and visitors coming and going through the church gave advice, suggestions, opinions, observations, ideas, and help with decisions. Their input was greatly appreciated and helped determine many aspects of the mural. For example, when a balance of color to compliment the large area of blue sky was needed, Kathy Kelly Huey suggested a spring of water, because Jesus is the water of life. This addition balanced the color and fit with the narrative of the earthquake that rolled back the stone. The earthquake started a spring of water from the rock wall behind the figure of Jesus. Mayra Marchand printed out the scriptures with references of the scene as told in the books of the Bible. The poses of the apostles Peter, James, and John coming out of the Mount of Olives were made possible because a visitor to the church agreed to run across the narthex. David Smith, who had been to the Holy Land, gave input for the shape of Golgotha, the acacia trees, and printed out pictures of the plants from the time of Jesus. The trees on the mural were growing in Jesus’s time: frankincense, myrrh, apricot, acacia, date palm, olive, and citron. They are blooming to represent the time of year, Spring, as are the iris, day lilies, cornflower, and flax. The ripe wheat and grapes symbolize the Eucharist. The bright white clouds at the top of the mural represent God the Father with rays of light pouring God’s grace down on Jesus. The Holy Spirit completes the Trinity. The border for the mural was started in November of 2018. The color of the border was painted to match the color of the windows and door frames found in the church. Final corrections and the addition of little birds and flowers were made in December. Vince painted the wall surrounding the mural with a color to compliment the colors of the mural. Vince gave great advice, many ideas, and without his help driving the lift, the mural would not have been completed. While the actual painting took six months, the research, ideas, composition, drawings, painting, and border took about 18 months. 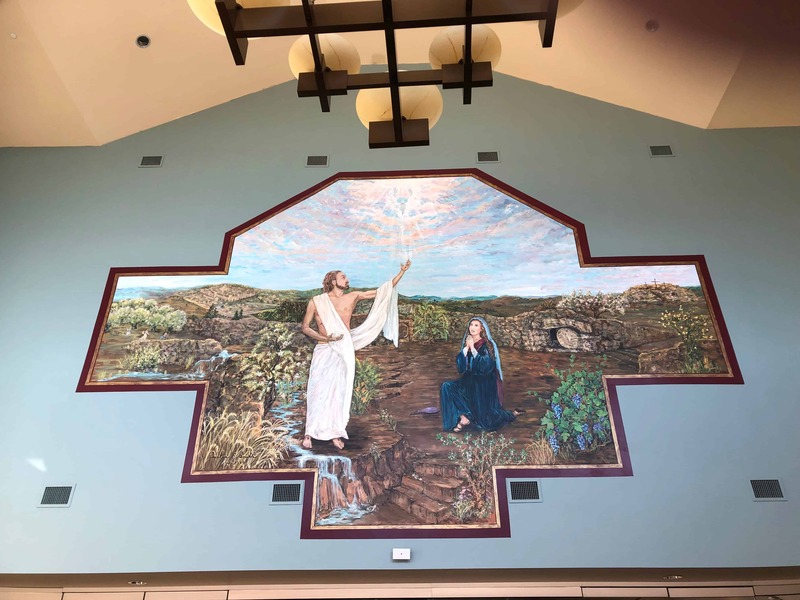 I am honored that Father Terry asked me to paint his vision of a mural for Mary Magdalene Church. I have thoroughly enjoyed painting it. Thank you to Father Terry and Vince, and all the people who listened and gave advice. I couldn’t have done it without you. As you know, a couple of weeks ago the news broke that over 300 priests in the 8 dioceses of Pennsylvania were named as pedophiles by at least 1000 persons, spanning a time period of 70 years. The most upsetting, to me, aspect of this case, is that the bishops, then and now, did not call them to task for their crimes, and, in some cases, those priests are still serving in parishes around children and vulnerable adults. First and foremost, my heart goes out to those individuals and families devastated by this offense against the moral and civil laws. I pray that they can find healing from within the Church, and in spite of the Church from friends and professional counselors. There is no good reason to keep the offenders working in parishes where they can do more harm. Secondly, these priests have provoked anger and resentment in the rest of us who, while still sinners, are shocked and concerned that the public will paint all of us with the same brush. All have fallen short of the glory of God, but for most of us, our sins have not caused so much trauma and scandal in the Church. The Jewish scripture scholar, Abraham Heschel, said that the message of the prophet is, “Few may be guilty, but all are responsible.” As a priest standing before you among the brotherhood of priests, I tell you, “I am sorry.” I am sorry that these sins and crimes have occurred, and I am sorry that those directly responsible have not been taken to task for their actions. Thirdly, I am also sorry that all of us have to revisit these tragedies after 16 years of knowing about them. The scandal out of Boston in 2002 forced the bishops to start moving in the right direction to implement policies designed for the protection of our people, but it appears that those same bishops have not taken ownership of the Church’s sin and pledged to root out the rot within her branches. Scripture says that all that is hidden will come to light. Why are the bishops hiding in the darkness waiting for the press or the criminal courts to come along with a flashlight? All of us are still disheartened and still furious with the goings on among fallen priests and political bishops, but we cannot lose hope. We are Christians, founded not on good advice, but on the blood of Christ crucified. When Jesus willingly took up the cross and died for our sins, he could see today. He could see the weakness of priest-pedophiles, and the weakness of bishops who turned a blind eye. Even Judas, his betrayer, was not exempt from his sacrifice of love. Truly the time for just words has passed and what is needed now is action. For many of us, it seems that our hands are tied: “What can I do to affect this issue?” Pope Francis has given us part of an answer: Fast and Pray. It may not seem like much, but prayer and fasting can change the world. Prayer and fasting transformed the greatest tragedy, the Crucifixion of the Son of God into the world’s greatest triumph, the power of life over death in his Resurrection. It seems that few Catholics today know that the directives of the Church still encourage abstaining from meat on every Friday of the year. Although we are allowed to substitute other acts of charity in the place of abstinence, I am asking our parish faithful to avoid eating any meat every Friday and pray for everyone affected: the survivors and their families, the perpetrators, and the bishops who ignored the problem and put more children in danger. I am asking we continue these acts of penance until the bishops in the U.S. turn over their records to the public. This may take a long time, but the spiritual benefits to ourselves and to the world will be immense. Only God can make good things out of evil actions, so let us beg him to transform our world through the sacrifices we make. The Archdiocese of Atlanta and St. Mary Magdalene Catholic Church are committed to the protection of our children and vulnerable individuals. St. Mary Magdalene Catholic Church complies with archdiocesan safe environment policies and procedures in accordance with the U.S. Bishop’s Charter for the Protection of Children and Young People. Safe Environment programs are in place to assist parents and children – and those whose duties involve contact with minors – in preventing harm to young people and other vulnerable individuals. 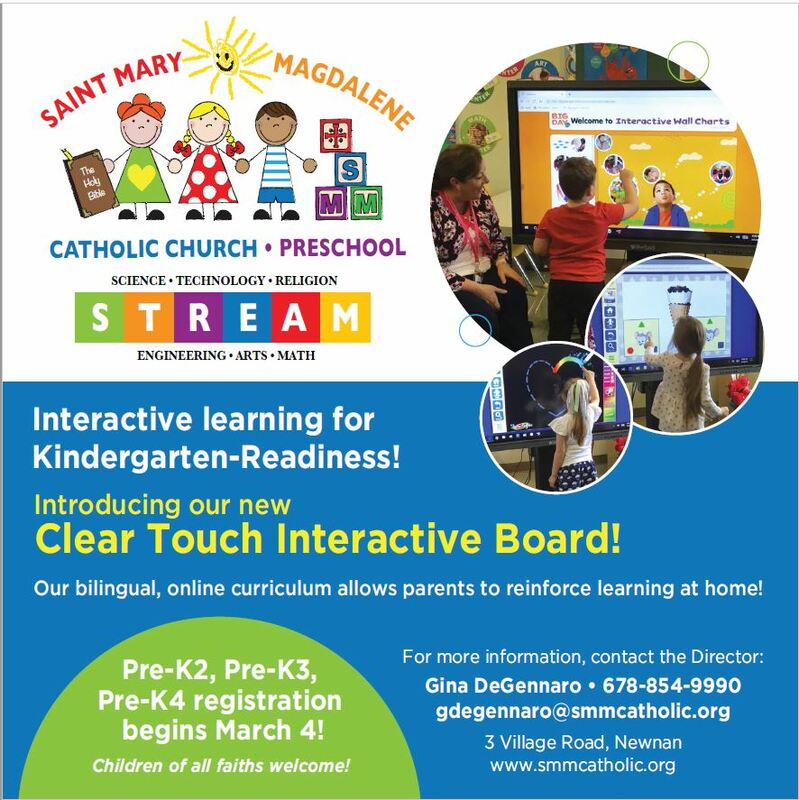 St. Mary Magdalene implements the Safe Environment training materials offered by the Archdiocese of Atlanta, VIRTUS Protecting God’s Children, a training program for adults and children in grades Kindergarten through 12th grade. You can read Archbishop Gregory’s letter about adopting the VIRTUS program here. The Archdiocese of Atlanta and St. Mary Magdalene Catholic Church require that all adult volunteers working with children, youth, and/or vulnerable individuals must complete the Safe Environment training (VIRTUS) and undergo a background screening before they start volunteering. Churches across the United States are being hit with an unprecedented number of email scams. Several of our parishioners have reported that they have received requests from our clergy asking for money or gift cards for various reasons. These scammers are exploiting the generosity and good will of people of faith. We hope that you will recognize that these emails are phishing scams and delete them. In most cases, if you pay close attention to the e-mail address of the sender you may discover a slight misspelling. Any requests by clergy for donations or financial gifts will be in the bulletin or by direct mail. You should never transmit personal financial information (validation codes, credit card numbers, bank account numbers, etc) via email. St. Mary Magdalene receives donations: 1) in the offertory basket, 2) online giving which can be reached from the parish website, or 3) in the parish office, in person or by USPS mail. NEVER VIA EMAIL. If you ever have suspicions or questions, please contact the parish office at 770-309-4584..
We received this question from a parishioner: Why don’t we add additional names to each Mass rather than one person per Mass? It would bring in additional revenue while parishioners get the date they want. Canon 947: Any appearance of trafficking or trading is to be excluded entirely from the offering for Masses. Canon 948: Separate Masses are to be applied for the intentions of those for whom a single offering, although small, has been given and accepted. These two items in the law mean that only one person (or family) may request an intention for each Mass (c. 948), and using Masses as a “fundraiser” is explicitly forbidden (c. 947). We realize that the delay between requesting a Mass and the Mass offered is often quite long, but the priority of the Church is that Mass be a spiritual endeavor, not a financial one. Certainly each of us can pray for whomever we wish at every Mass we attend, but the priest celebrant can only offer one intention for which he receives a donation.